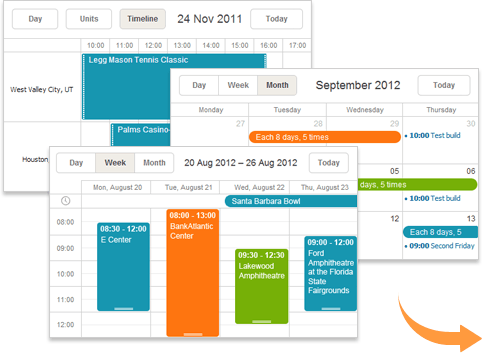 DHTMLX Scheduler .NET is a full-featured calendar control that allows creating attractive Ajax-powered event calendar with a rich user-friendly scheduling interface. Scheduler samples for ASP.NET MVC and Web Forms in C# and VB are included into the trial package! Supported frameworks: ASP.NET 3.5, 4.0 and 4.5. Supported IDEs: Microsoft Visual Studio 2013, Microsoft Visual Studio 2010 and Microsoft Visual Studio 2008 Service Pack 1. Full 30-day trial version; Commercial/Enterprise License available; 30-day money-back guarantee.